Are you using Google chrome on your android device? If yes, then you will be glad to know that the latest version of Chrome for android adds in a new feature to reduce your internet data usage. One of the most common complaints of android users is usually related to the data consumed by their android devices and the newly introduced data saving feature onchrome for android specifically addresses this problem while browsing the internet. 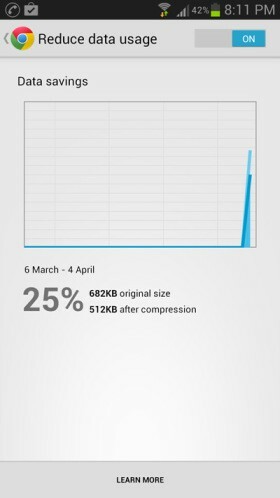 The new data saving feature on Chrome for android works similarly to Opera’s data compression feature which has been there for years. When the data saving feature is turned on, all the data received by Chrome is routed through Google’s data compression servers and thus Chromes receives a significantly compressed version of the webpage. Using this feature, Chrome will be able to load web pages much faster and at the same time it will also be able to reduce the overall data usage. By default this feature won’t be turned on and If you want to turn on this feature, here’s how you can do so. Step 1: Open the Chrome browser on your android device. Step 2: Now navigate to Chrome’s settings and tap on Bandwidth management. 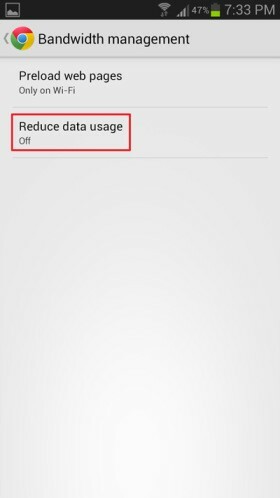 Step 3: Tap on Reduce data usage. Step 3: Finally tap on the OFF button to toggle on the Data compression feature on Chrome for Android. That’s it, now all the websites that you browse using chrome will be compressed by Google’s server. Additionally you can also view the amount of data compressed by this feature. To do so, you will need to go back to the bandwidth management settings and tap on Reduce data usage again. Overall the new bandwidth management feature is definitely a boon for people who primarily use mobile internet connections to browse the internet.